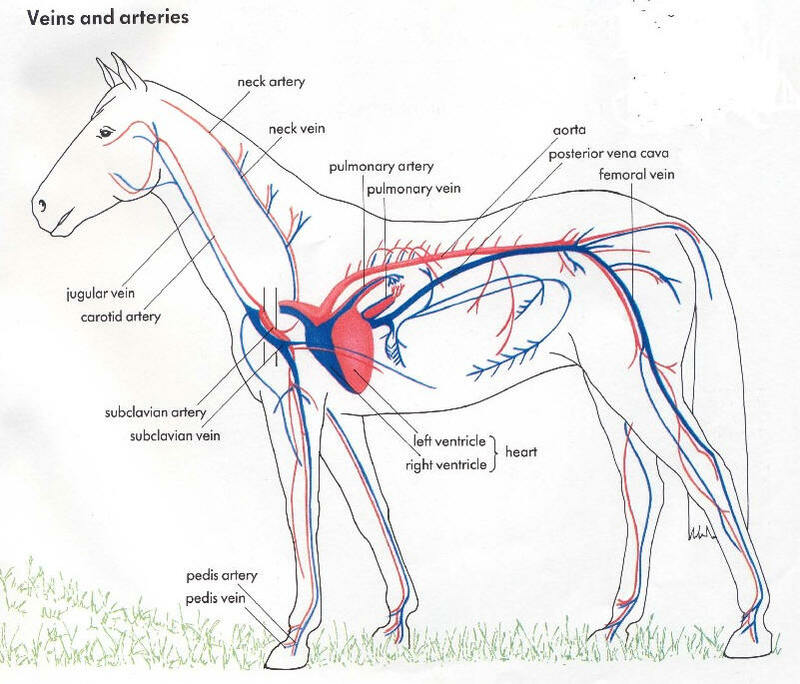 The circulatory system (heart and blood vessels) works together with the respiratory system, to provide oxygen throughout the horse’s body and transport waste material from the tissues. During exercise, the circulatory system is one of the main systems to provide energy to the bones, connective tissue, and muscles. The horse can suffer from many symptoms when the heart and/or blood are not functioning optimally. Below are just a few of these common areas in relation to the circulatory system. Signs of a heart problem might include a loss of condition, shortness of breath, slow recovery after exercise, an increased effort to breathe, a shorter period of exercise before development of fatigue, and general weakness. Fluid accumulation in the abdomen, legs, or under the skin surrounding the ribs is another indication of poor heart function. Owners or trainers who suspect a disorder should contact a veterinarian who can examine the horse’s heart and determine the cause of the problem prior to use of EquiHealth. The horse has few problems with its circulation in the upper part of the limb. However, blood is returned with difficulty from the lower part, because of the absence of muscle and its massaging effect. This can be seen in the swelling of the soft tissue, immediately above the hoof, which occurs when the horse is confined, for any length of time. Also the slow return of blood is associated with retarded healing of wounds to the extremity. A similar situation holds here as in the fore limb. Additionally, the blood supply to the limb from the aorta (in the roof of the abdomen) may be reduced owing to disease of that vessel. This is an inflammation of the small, boat-shaped bone (navicular) bone placed behind and deep within the hooves on the front feet. Cartilage erosion to the point where the bone underneath may become exposed if not treated. Recent research has also found correlations between a “toe-first landing” of the hooves and navicular problems, due to excessive strain on the deep digital flexor tendon. This may occur in a race horse, after a race. Although nosebleeds can look alarming, in most cases they are not serious. Even if minor it can look very dramatic. A nosebleed (‘epistaxis’) — occurs when any part of the nasal passages, throat, lower airways, or lungs are traumatised to a point where the blood vessels are damaged and blood leaks out. The commonest cause is a knock of some kind to the delicate nasal tissues. A moderate nosebleed, if accompanied by coughing, may suggest a foreign body wedged in the nose or throat. Veterinary attention will be needed. The blood may be coming from deep down – in the lung, or high up – from the nasal cavity. Traditional treatment can include antihistamines or cauterisation of the enlarged blood vessels at the back of the nasal cavity. The heart rate varies from 30 to 40 per minute in the adult horse, to 70 to 80 in the foal, up to one year old. The rate rises with exercise. Palpitations, describes the rate when it is unduly fast. This may be an indication of a stress condition, or a more serious underlying circulatory disorder. Once cause has been established, natural treatment can begin with both herbal remedies, and location of blocked acupressure points for rebalancing. This is an inflammation of the last bone in the leg (pedal bone), which has the same shape as the hoof which encases it.It becomes progressively porous, to the point of fracture. This seems to be caused by repeated concussion against a hard surface. Pedal Osteitis is one the main reasons for a horse to have long-term pain in its feet. The prognosis for full recovery is variable, and is dependent on the actual diagnosed cause, as well as the degree of improvement that can be achieved, especially through hoof correction.